Academic Support Labs provide academic interventions for students in need of credit recovery, instructional support, and a personalized learning plan. 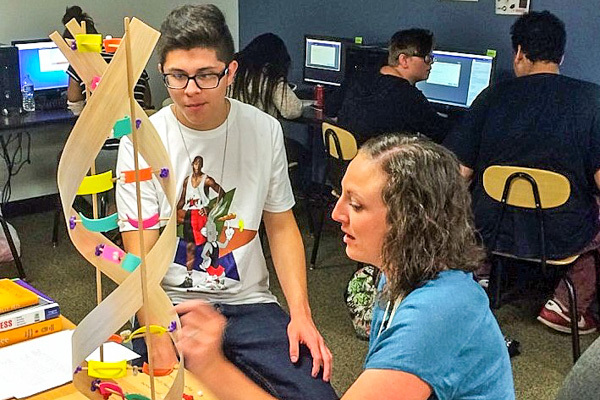 The Academic Support Labs (ASLs) are non-traditional 21st century classrooms that provide engaging academic interventions for our students who are in need of credit recovery, instructional support, and a personalized learning plan. The lab environment embraces students where they are, encourages a growth mindset, and celebrates the power of yet. Each lab has an endorsed English, Social Studies, Math, and Science teacher who provide content expertise and differentiated instruction. Students are assigned to one teacher who personally tracks their credits, progress, personal goals, interest, and style of learning. In the lab, students are supported to discover academics through a variety of approaches that enable them to individually refine a preferred learning style. This experience includes online instruction, project-based learning, science labs, research, writing, group projects, and individual tutoring. Learning topics range from global and national perspectives to a local one, designed to relate the curriculum to real world experience. Students are assessed using the standards-referenced approach, which is instruction aligned to content focused learning standards. Teachers guide the students through knowledge they are expected to learn, provide continual feedback for improvement, re-teach when necessary, and allow numerous opportunities for practice. The results yield self-direction while preparing students for college. The Academic Support Labs are designed to accommodate those students identified by the Early Indicator System as potential dropouts and re-engaged students who are in need of additional support as identified by the school’s student support staff. Priority for placement is given to re-engaged students and under-credited seniors.